Sweet Peet is a 100% organic product made from composted ingredients harvested from local farms. 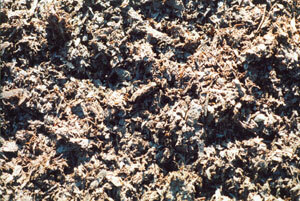 Its rich dark color and natural texture are the perfect visual enhancement in any landscape setting. With a high moisture retention value, it is excellent for perennial, ornamental and vegetable gardens, and around the base of trees and shrubs. As a superior soil conditioner, Sweet Peet is fortified with farm manure and reduces nitrogen-borrowing when tilled in around root zones of plantings. It adds tilth to the soil and aids in moisture retention. Unlike cedar, pine, and bark by-products which are used with acid loving plants, Sweet Peet benefits all other plantings, and its regular use can eliminate the need for applying caustic limestone. Sweet Peet has a sweet, earthy smell. It differs from many mulches and soil amendments in that it contains no human waste and no construction or demolition debris (which can include ground up nails, glass, plastic, creosote or wood preservatives). Sweet Peet contains only virgin wood products, farm manure and plant fibers, and derives its color from naturally occurring tannins which are baked in during composting, and which give it the dark color and texture Sweet Peet is famous for. Sweet Peet is safe for children, pets, plants, and all living things! A natural product formulated for our changing environment, Sweet Peet is especially beneficial in the Eastern United States, where existing acid soils are further aggravated by sulphur emissions and acid rain. It is weed free and qualifies in any organic certification program. 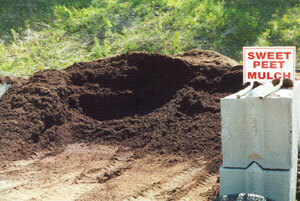 3-6″ of Sweet Peet should be applied directly on top of bare earth. For longer lasting weed suppression, lay down several sheets of newspaper or heavy mill plastic first. Sweet Peet may also be roto-tilled into topsoil to improve tilth and moisture-retention. Re-apply annually.